I love the strong flavours and dishes full of punchy ingredients, including kimchi, a fermented cabbage dish that is served with virtually everything. 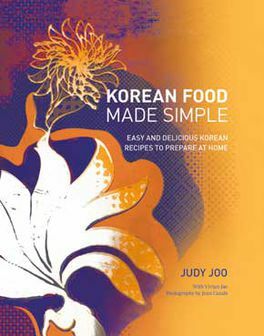 Judy’s recipes are from her new book Korean Food Made Simple. Her fried fish with Korean mayo and sesame mushy peas followed by boozy plum granite (both opposite) have a summery feel to them, perfect for this time of year. I’d love to invite her on to my live Radio Soho foodie show. It goes out on Mondays from 11am-noon and my recent guest, MasterChef’s Gregg Wallace, helped me judge a cocktail competition for Italian drink Galvanina. So give Judy’s recipes a go, especially if you haven’t tried Korean food before. In a small bowl, stir together the mayonnaise and kimchi. Cover and refrigerate. Bring a medium saucepan of salted water to the boil. Add the peas and boil for 2-2½ minutes until bright green and soft. Drain and transfer to a food processor. Add the garlic and sesame oil and season with salt and a generous amount of pepper. Process to form a chunky paste. Return the mushy peas to the rinsed pan and keep warm. In a wide, heavy-based pot at least 13cm deep, heat 5cm of oil over a medium-high heat until it reaches 190°C. In a large bowl, whisk together the flour, kimchi juice, chilli paste, garlic powder and onion powder into a thick paste. Whisk in the soda water, being careful not to over mix. Generously season the cod fillets with salt and pepper and lightly sprinkle both sides with the flour. Spread with your fingers to coat evenly. Dip each fillet into the batter, letting any excess drip off. Suspend the fillet in the oil for a couple of seconds to set the crust before letting it slip completely into the oil. Fry the fish for 3 minutes, flipping halfway through, until golden brown and cooked through. Transfer to a wire rack or kitchen paper-lined plate to drain and season, if desired, with salt and chilli flakes. Repeat with the remaining fish, letting the oil come back to temperature before cooking the next batch. Serve immediately with the kimchi mayonnaise, mushy peas and lemon wedges. Put the plums in a medium heavy-based pot. Add the sugar and a pinch of salt and toss together. You may need more sugar, depending on how sweet the fruit is. Stir the mixture over a medium heat until the sugar has dissolved and the plums start to release their juices. Increase the heat to bring to a gentle simmer and cook, stirring, until a chunky, bright-red puree forms. Pass the mixture through a fine-mesh sieve, pressing down with the bottom of a ladle. Discard the solids. Add the wine, lemon juice and 600ml water to the bowl with the puree and mix well. Pour into a non-reactive 23cm x 33cm dish and transfer, uncovered, to the freezer. After 3 hours, the granita should be slushy in the centre and icy at the edges. Use a fork to break up and mix the icy portions, pulling them to the centre. Return to the freezer for a further 1-2 hours. Rake a fork over the surface and scrape to create flaky crystals. Return to the freezer and repeat as needed until the granita is light and fluffy. Cover. With a four-prong curly zester create long, thin strips of lemon zest. Toss the zest and sugar together on a large plate. Spread in a single layer and leave to dry for 30 minutes. Tap off any excess sugar. Scoop the granita into bowls and top with the crystallised lemon zest. Recipes taken from Korean Food Made Simple: Easy And Delicious Korean Recipes To Prepare At Home by Judy Joo (£22, Jacqui Small), photography by Jean Cazals.